Although Alf Garnett as a character belonged to the nineteen-sixties, under the tutelage of writer Johnny Speight and actor Warren Mitchell he proved unexpectedly long lasting, turning from the reactionary old horror of the decade of civil rights, sexual liberation and flower power to something peculiarly more cosy. The series that spawned him was Till Death Us Do Part which started in 1965 and gathered up the lion's share of audience figures and press attention as he spoke the words a supposedly progressive society was not meant to be thinking, and was suitably lambasted by his daughter (Una Stubbs) and son-in-law (Anthony Booth). This carried on for a perhaps surprising ten years, after which the BBC decided to move on, but for Speight this was his signature creation and he wasn't about to let it go so easily. He had penned a couple of films around Alf in 1968 and 1972, and in 1981, some six years after it appeared we had seen the last of him, he and Mitchell switched channels to ITV - ATV, to be exact - and the shortlived revival Till Death… The title had been shortened thanks to the BBC owning the copyright on it, but it wasn't just now-morbid renaming that had the series regarded as a failure, there were important elements absent too, most notably Booth who had refused to return. Stubbs was back, and the baby from the original show was now a punk teenager (John Fowler) arriving at the time when the New Romantics were the latest youth movement and punks were decidedly old hat. Then there was the issue of the lack of a studio audience; nowadays, many are annoyed by the presence of gales of laughter on the soundtrack to whatever sitcom they have tuned in for, but for a long time the laughter was highly important, and not simply because they told people watching at home where the jokes were. Till Death Us Do Part had succeeded thanks to a very audible reaction of an audience who could scarcely believe what Alf was spouting. This shock value generated anything from chuckles to uproarious guffaws, and without it Alf just came across as a bitter old man struggling with life, something more appropriate to Play for Today than comedy. Indeed, for five out of the six episodes this revival resembled a soap opera, as if ATV's Crossroads was Speight's biggest influence, and the other one which featured slapstick of a sort, a more traditional sitcom plot as Alf wrestles with his new motorbike, actually had the laughter included. As a result, it was more like what Speight was presumably aiming for, as too often for the rest of it Till Death… was merely a collection of grumpy, defeated folks complaining at each other. 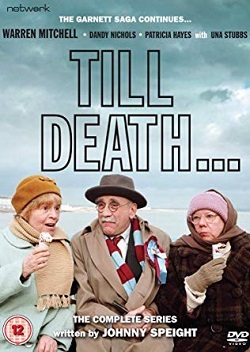 The first episode was a curiously reflective one, with Alf, wife Else (Dandy Nicholls was back too) and their widowed pal Min (Patricia Hayes) wandering along the Eastbourne seafront they have moved to. After that, Alf encountered more elaborately made-up punks (and is terrified), the trauma of the television breaking down, and the possibility he may be an alcoholic (not exactly hilarious), in between shouting matches with his daughter. As ever, Mitchell absolutely nailed the delivery, as he had from day one, but the character's racism, sexism and conservatism rendered him a rather sad reminder that society moves on and leaves many behind. However, Alf may have been down but he was not out, and in 1985 Speight and Mitchell revived the character back on the BBC with In Sickness and In Health, proving, if anything, as successful as the sixties series - this ran to 1992 - although Garnett was no longer the national talking point he was back then. This eighties series was more a show for the older viewer who sympathised with Alf and his confusion at the way the world was going, clinging onto the older values the Conservative Government claimed to be bringing back, though Alf had mixed feelings about the nation being run by a woman, sticking to the belief that a woman's place was in the home. It seemed like an age until Garnett was back in his last series, for LWT, The Thoughts of Chairman Alf. This had been based on the concept tried out for a one-off special for ATV around the time of Till Death… though had not been picked up, but the idea was simple: Speight would write a number of routines and observations for Mitchell to deliver to a live audience who would react and, with any luck, laugh appropriately. As the audience had been so vital to making Garnett palatable back in the sixties, in the multicultural world of Cool Britannia of the nineties, a reactionary like Alf had an interesting role to play, pointing out that his kind had never gone away. Don't forget that post-1997, it may have been the hopeful era of New Labour, but it was also the era of New Laddism, where Men Behaving Badly was the biggest sitcom on television where acting like a boor entertaining in a manner that Garnett's politics had not been. And besides, the glow of Britain's new faith in itself was already beginning to dim by 1998 when Chairman Alf, basically adopting the An Audience With... format for six episodes, took to the stage as we realised that perhaps things were not changing as much as we thought, though his racist insults were left out. But was there a place for this satirical character this far past the sixties? It turned out to be Speight's final work, as he died shortly before it was broadcast, but proved he still had all his faculties when it came to choosing his targets from all strata of society, and the multi-racial audience he was presented to was a wise move, especially as many of them were there to take the Mickey out of Alf. Yet there was plenty of unironic laughter at his pronouncements that suggested he was a lot more in tune with the times than many would prefer to think, even Speight and Mitchell who insisted Garnett was a creation designed to be lampooned and criticised. It wasn't quite the old Nietzsche quote "Whoever fights monsters should see to it that in the process he does not become a monster," but maybe it wasn't far off. Sure, we could laugh at subjects like sadomasochism and Tony Blair's secret Scottishness, but underneath it all there was the worry that prejudice would never go away. Incidentally, how old was Alf supposed to be? By '98 he must have been a hundred years of age! [Network have released Till Death... and The Thoughts of Chairman Alf on separate DVDs. 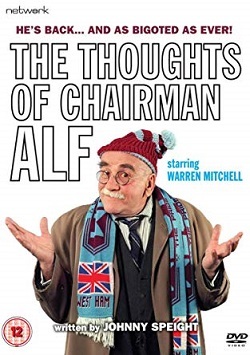 No extras on Chairman, but Till has the original Thoughts of Chairman Alf... At Christmas special and an image gallery.